It was looking like a BEAST in the Sky. Storm ends phase 2 heatwave for Kent. What a night it was last night when the heatwave came to an end after temperatures over 35°C or more reported quite widely this week. Thunder and lightning with rain moved across Kent and other parts which certainly bubbled up into some amazing sights in the sky. 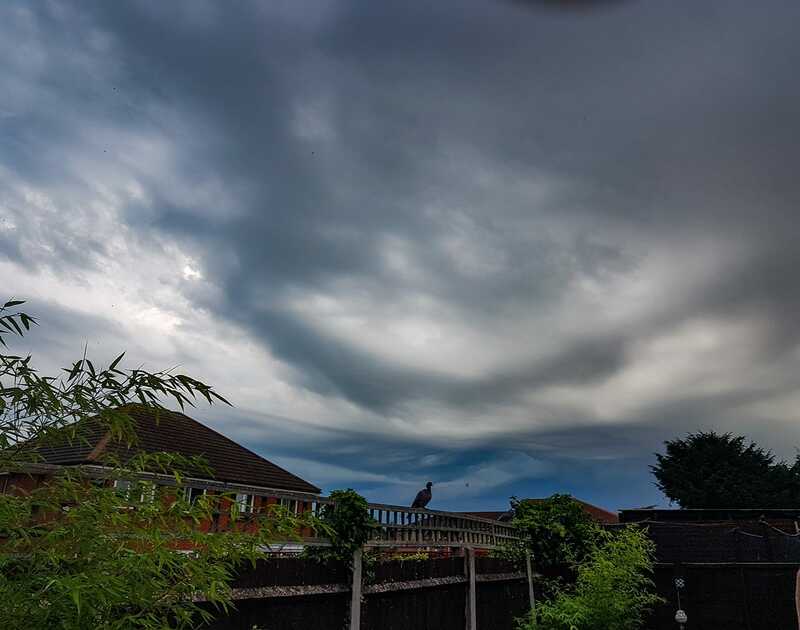 Deep shelf clouds could be seen quite widely including Sittingbourne and other parts of the Swale District. A storm was pushing East of the Swale when a alert was soon downgraded after the main storm came to a end for us here across Swale. All together there was 215,000 lightening strikes reported over the British Isles from 7 AM Friday 27th July 2018 until 7 AM Saturday 28th July 2018. Our storm chaser Damon Webb was out braving the storm. There was plenty of rain for some of us but some places remained dry overnight. Since last night 4.8mm of rain was recorded in total from our weather station in Sheerness. Rain amounts in the buckets will be different for other areas so please do check them if you can. A Storm touched down after a heatwave came to an end. Look at this monster we captured. Monster shelf clouds moving East towards the Swale. It was like nothing we have captured before apart from our famous Funnel Cloud. A storm was certainly brewing. Moving East of the Swale. 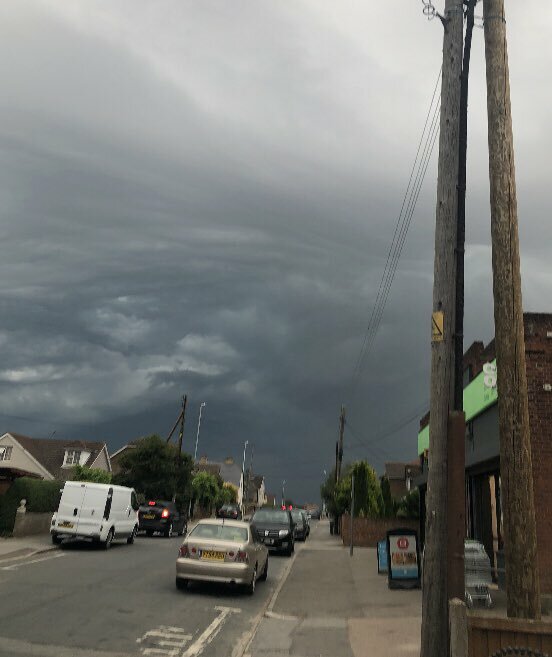 Taken before the Storm in Sheerness. By Emily H.
Taken in Sittingbourne Friday Credits @danieltpope Twitter. 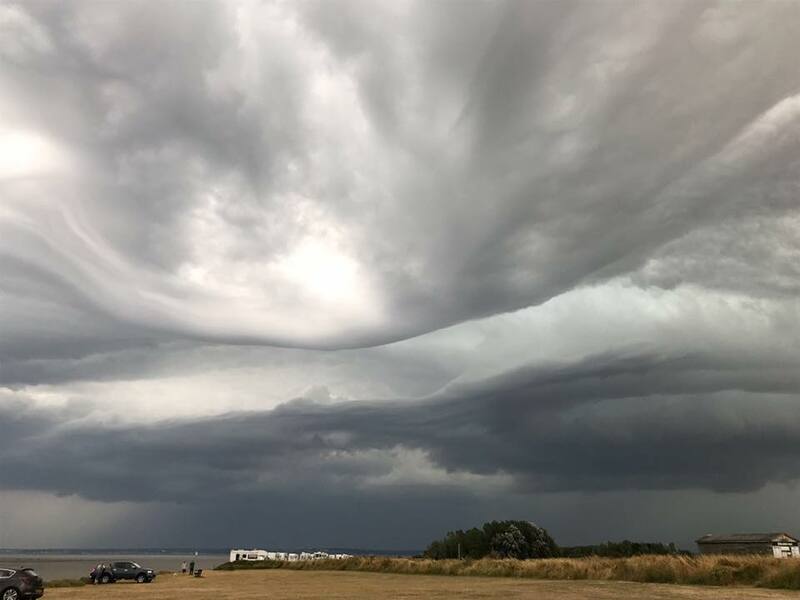 Deep Shelf Clouds – Taken at Leysdown Coastal Park by Craig H Friday. It is likely on Sunday that nobody will get away with the rain as as the low will extend before another high pressure system arrives for next week basking way for more high temperatures in the forecast as we move into August 2018 with 29+C prodicted. We want to thank anyone who was tuned into our live feeds last night and your support has been much welcoming from all of us here at the Swale Weather Center. We provided you great weather information when you need it most from all of our partners in the weather media. The new website will be launching very soon which includes a nice responsive interface for you to interact across all devices. We will soon be adding sub pages to the design to include some great weather resources for all weather fans. We will soon launch a guided tour of the new design. Right now we have work to do. See you soon. This week temperatures are set to climb at a record high for the year so far. Heat and humidity started building yesterday around the Swale District. We recorded 29.3C on our charts. From today temperatures are expected to rise higher. By Thursday we could be seeing 34C on our charts around the District and the rest of Kent. This will mark our first short heatwave of the year so far with temperatures set to remain on the high side for the rest of the week. We will have the chance of some T-Storms from Tuesday onwards. As temperatures are expected to fall a bit lower we do expect them to remain in their 20s for the rest of the week around the Swale District and the rest of Kent. It is safe for us to say Summer 2016 is here. There may be some light at the end of the tunnel for those who are hoping for snow. Some got lucky Sunday night around kent which delivered a dusting for some. There are possibilities of some more cold air moving in next week after a mild return this weekend. This is currently being monitored and may or may not deliver snow. End of Feb into March is looking promising. We are hoping that the Swale District will get some snow before the Spring sets in. 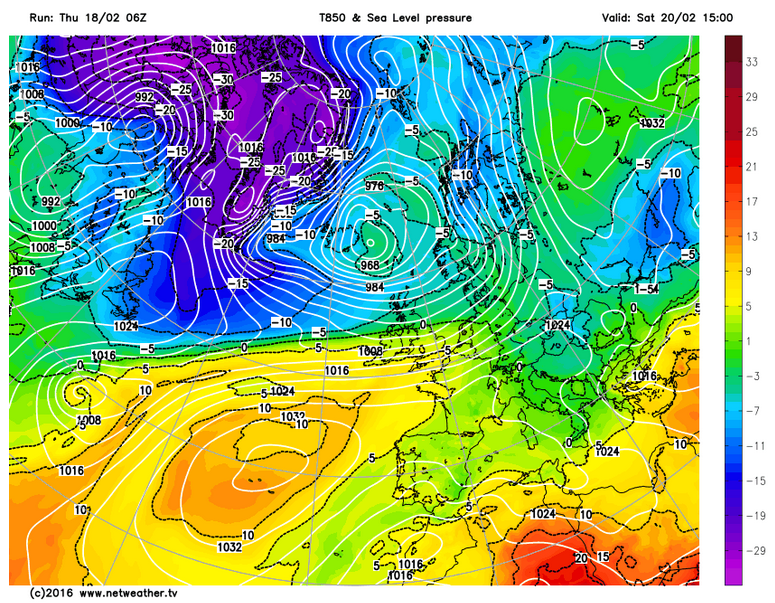 At the moment it is looking like a cold start to March. As you know the charts which was delivered to us in January did not deliver any snow for Swale. At the moment we are starting to see a change in our weather pattern which is bringing in much warmer conditions. As briefed by the Met Office they claim 2016 could be the warmest on record yet. As our climate is changing the UK could see more on the wet and windy side which will increase river levels leading to more flood risks plus widespread damage by winds. As snow is so hard to predict. We at Swale Weather are working on every way possible to deliver new and accurate snow forecasts for the near future. We are already working on new charts and new interface designs along with our new android app which we hope to release soon. We have a current basic version of our app you can currently use on your Android Device. You can also check UKSnowMap to find out where it is snowing in the UK. Snow risk for Sun into Monday is up 30% for SE England. Not much precipitation hours but looking good. Looks like all change again this week. It will be cold with no signs of snow but we will keep you updated here. As you may well be aware Storm AbiGail is set to cause some problems as we head through Thursday and Friday. The Northern part of the UK is set to see the worst conditions with winds of 90+MPH. Met Office already have Amber warnings in place and it is best to keep a check on these as they get updated frequently. 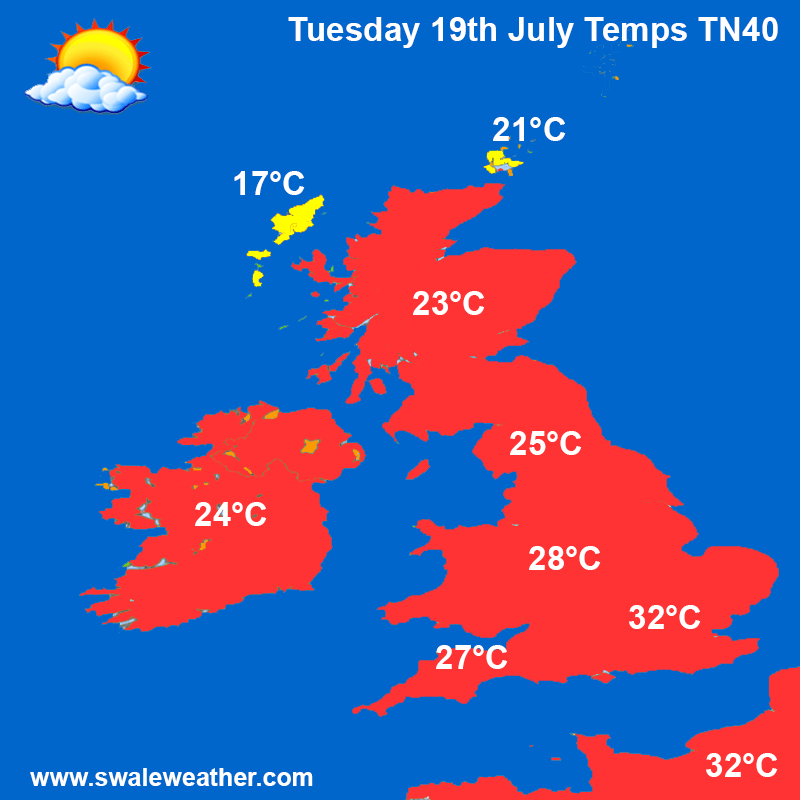 We will see some bad weather this week across Swale and Kent. It is set to be the worst on Friday and into the Weekend for Swale and Kent as a new Low moves in across the Southern Half of the Country. It does mean we will see less windier conditions across Kent. 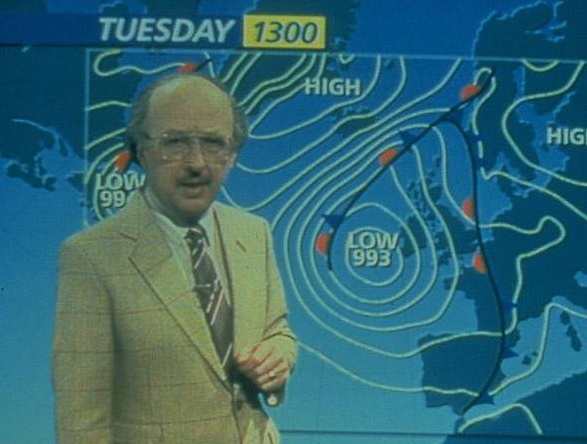 as its mainly the Northern half of the UK who are set to be hit by Storm Abigail. In the meantime take extra care when out and about. We remember the Great Storm of 1987 and it was one we will not forget in our lifetime. As for us in Swale we should not be worried about a Greenhouse blowing away this week but it is going to be wet this weekend. However some across the UK may experience a blast from the past. We are working on the Swale Weather Snow Project. You yourself will be able to report when it is snowing in Swale and post pictures of it. This will be rolled out this Autumn to all Swale Weather Fans across the Swale District. We are hoping to make this service as popular as possible for our Community. See if you can come up with idea’s for the project by commenting below. We will review them and hopefully will bring your idea’s to life in the project.